Ph. D. (Mechanical Engineering), Imperial College of Science and Technology, London, 1980. M. Sc. (Mechanical Engineering), Cairo University, Egypt, 1976. B. Sc. (Mechanical Engineering), Cairo University, Egypt, 1974. 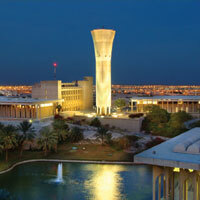 Recipient of the Distinguished Research Award for the academic year 1994-1995, KFUPM. Selected as Distinguished Instructor, Mechanical Engineering Department, KFUPM, for the academic years 1993-1994 and 1994-1995. Selected as Distinguished Instructor, College of Engineering Sciences, KFUPM, for the academic year 1993-1994. Selected as Distinguished Academic Advisor, Mechanical Engineering Department, KFUPM, for the academic year 1994-1995. Created by ITC | of Information & Technology Centre KFUPM.